Thanksgiving is less than a month away! Thanksgiving is my favorite holiday. Family. Friends. Food. Football – what’s not to love? It is a time a year where people quit all their griping, complaining, & selfishness & instead, take time to sit down to a good meal with family & friends & be thankful for how truly blessed we are. 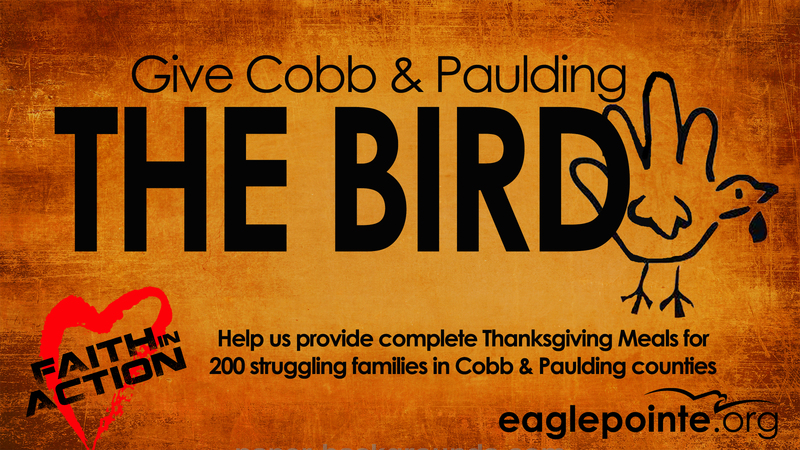 Sadly, there are hundreds of people & families in Cobb & Paulding who will go without a Thanksgiving Dinner this year. Times are tough for a lot of people & this year we at Eagle Pointe are going to do all we can to make sure on Thanksgiving Day everyone sits down to a great meal. We can sit around like most people and talk about what we are going to do – or we can take action and GIVE COBB & PAULDING THE BIRD! Eagle Pointe is organizing this initiative for our area, but this is an event that EVERYBODY in our area needs to get behind. In addition to collecting for our Winter Survival Kits for the Homeless during the month of November & as part of our Faith In Action Day on Nov. 21st – we are going to provide complete Thanksgiving Meals for 200 struggling families. We’ve got 3 weeks to pull this off & in order to make this happen, some mountains need to be moved very quickly. Please talk with all of your friends, co-workers, boss, etc & help to round up sides & desserts, and/or DONATIONS TO HELP PURCHASE TURKEYS. Donations to purchase Turkeys or side items/desserts can be made online CLICK HERE & select “Give the Bird”. This entry was posted on November 3, 2015 by Howard J Koepka. It was filed under ministry .